The ideal way of evaluating and demonstrating the potential and viability of a proposed business model or solution is to present a snapshot of it in the form of a business case. The business case template that can be downloaded from Bright Hub’s media gallery will make it easier for you to make a systematic and professional looking business case. A strong business case is a hard selling copy of your business proposition that can help generate clientele, financers, and investors. The following instructions will guide you on how to use this simple business case template to make a strong and weighty business case. Name of the specific project. Name of the individual or team that has prepared the business case. Date of preparation of the business case. A list of the previous document versions for document version control. 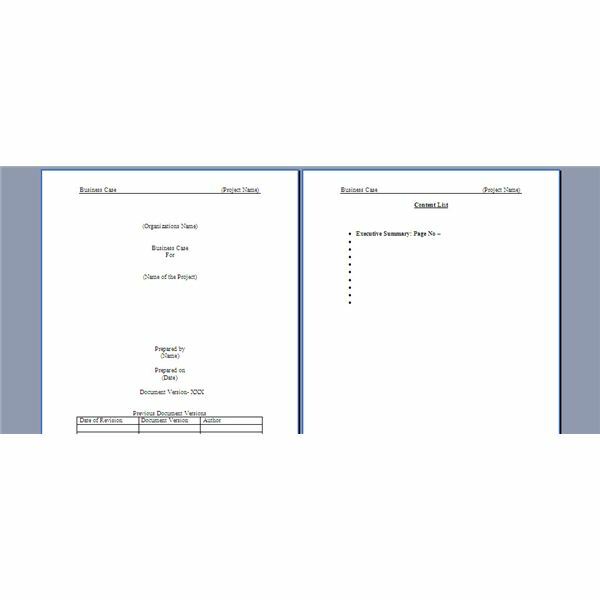 The second page of this business case template is meant for a table of contents, which must be written only after the entire business case is ready. of the project objective and the chief benefit that the proposition offers. The supportive reasoning follows these brief descriptions, wherein the reasons that prove the effectiveness and the feasibility are detailed out. The critical success factors – which will determine the success of the project, must also feature in the executive summary. And finally, the executive summary must list out the chief project team members who will be responsible for execution of the different aspects of the project. A detailed description of the objectives and the scope of the project. If needed the objectives can be put up as a bulleted list. A list of stakeholders – listing the names of all the team members in the stakeholder teams and detailing out the roles of the teams. A list of the project milestones mentioning the dates for each milestone and the deliverables at each milestone. The names of the teams or persons responsible for achieving the milestones can also be enlisted alongside. Project risks – this list should describe the risks, assign a severity to each risk and talk about the countermeasures to fight each of them. A list of deliverables – that details out the deliverables, and specifies the due dates for them. Next come lists of internal as well as external resources with the purpose of each resource and its costs mentioned alongside. A list of benefits – that talks about the benefits and the impact of these benefits on the various aspects of the business. A detailed financial appraisal – depicting the various costs and variances, to justify the expenses and prove the financial worth of a project. And at the end of the template is some space reserved for listing the authorizations for the various aspects of the project. This business case template is fairly simple, while it still does cover all the important aspects of a business case.